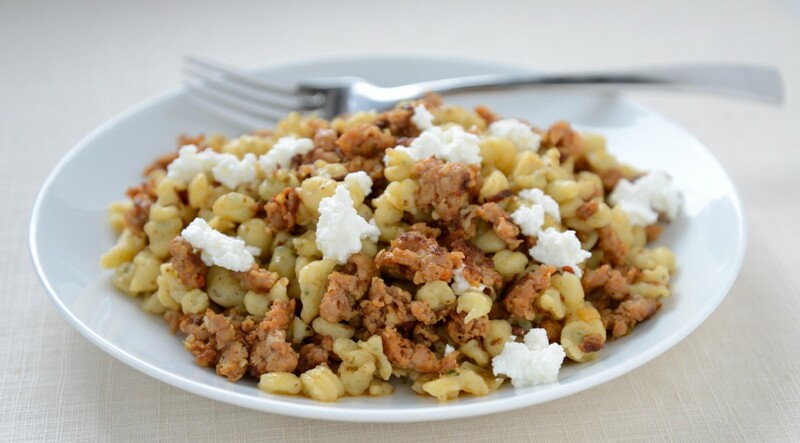 Spaetzle are tiny egg gnocchi made across Europe, especially Hungary, Austria, and Germany. 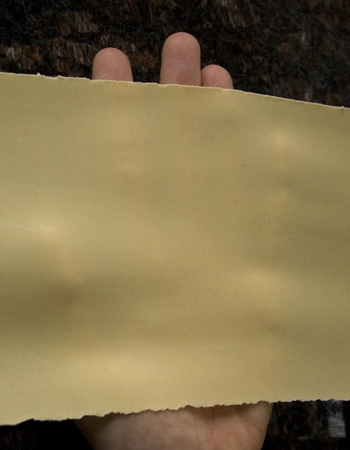 They are typical of Trentino-Alto Adige, a region in Italy’s northwest that was under Austro-Hungarian rule. 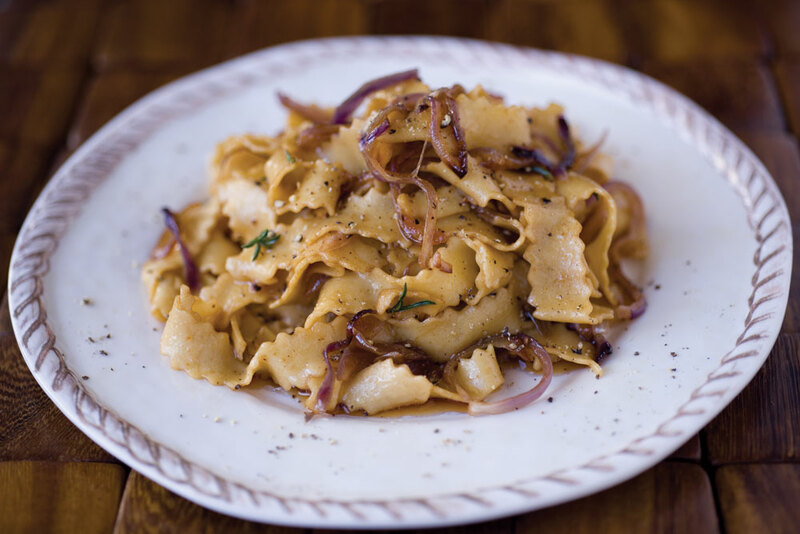 I often make spaetzle when I am short on time and still want a fresh pasta. 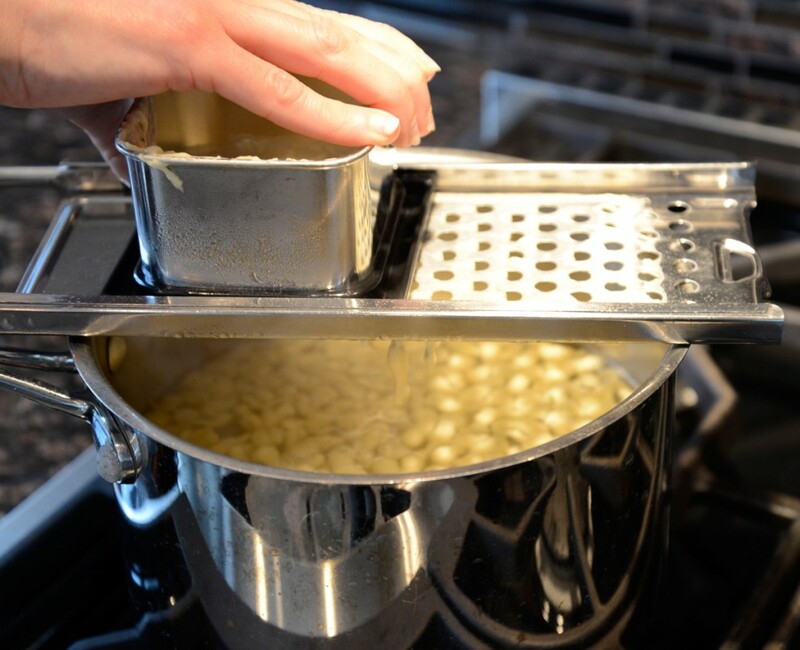 They are easy to make, as long as you have a spaetzle machine (more on that later): just whisk an egg and some milk into flour, beat until smooth, and pour through the spaetzle machine into gently boiling water. 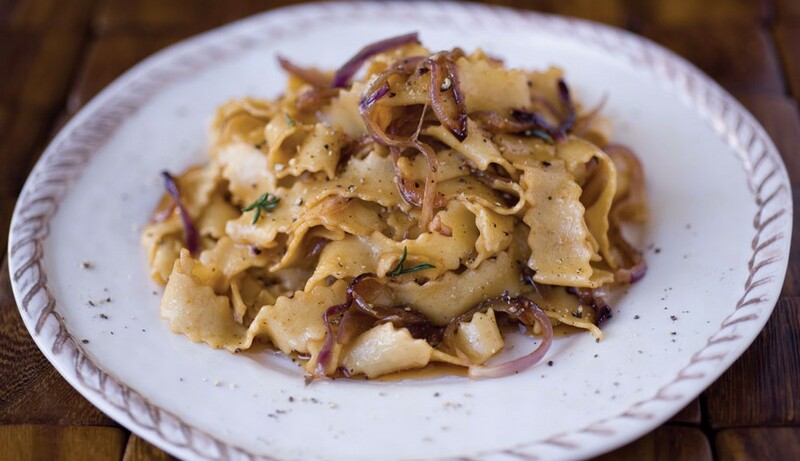 When the spaetzle bob to the surface, they are ready to scoop up and toss with whatever you like: olive oil and grated Parmigiano; crushed poppy seeds and Ricotta Salata; melted butter, sugar, and cinnamon for a sweet treat; the herb-infused juices from a roast veal or chicken; or the savory sausage sauce below. One thing I do not suggest with spaetzle is a heavy tomato-based sauce, which would overwhelm the delicate flavor of the gnocchi itself. 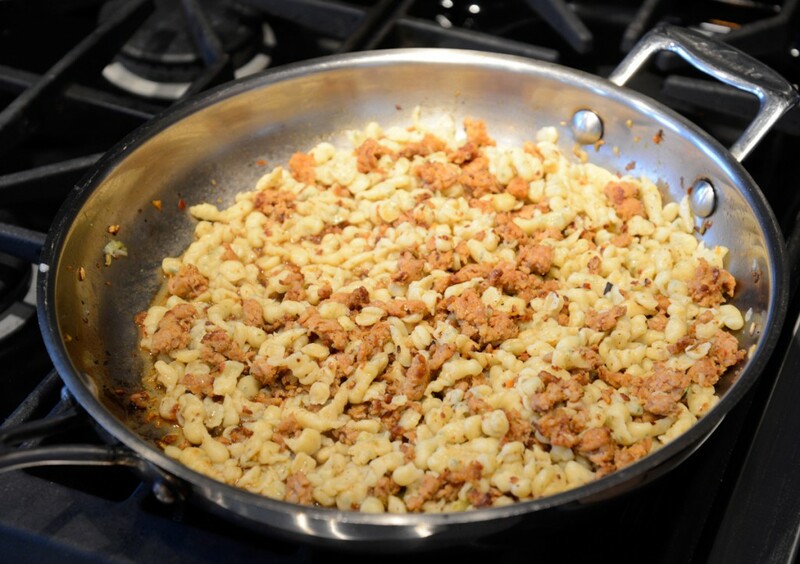 Spaetzle are also an excellent accompaniment to hearty stews and roasted meats. There are many Spaetzle machines on the market, and some work better than others. 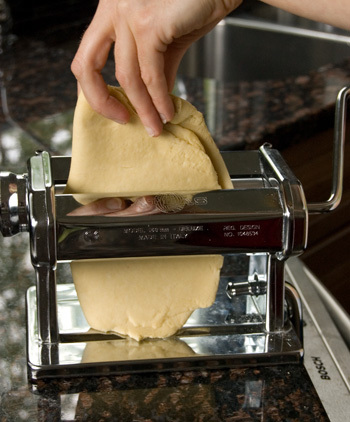 Some people like to use a spaetzle press, which looks like a potato ricer. Other people opt for the machine that has a sliding box set atop what looks like a box grater; I prefer this model. Mine is all stainless steel and, as long as I wash it before the batter dries on it, takes just minutes to clean. 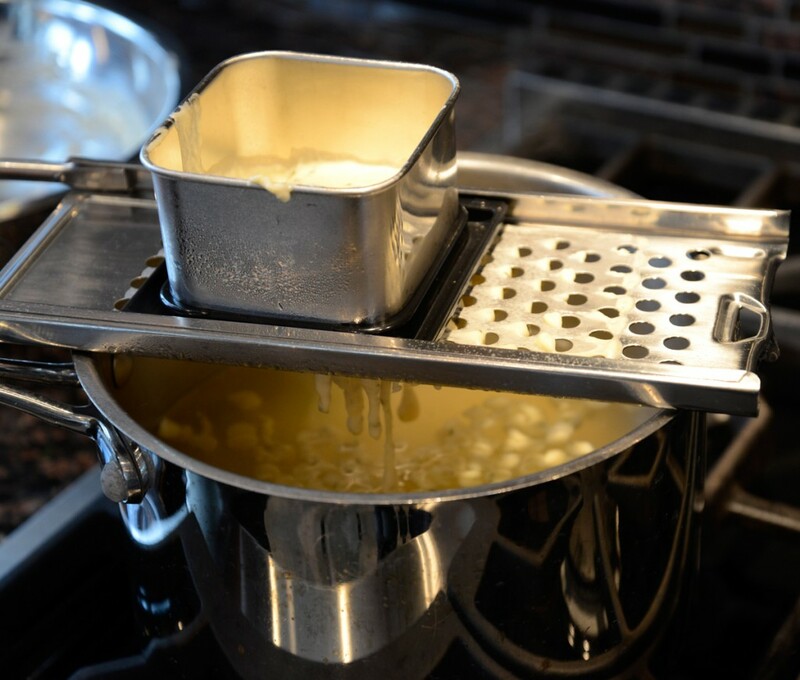 I toss the machine into a sinkful of warm, soapy water while the spaetzle cook, then wash it easily afterwards. When making spaetzle to serve with sweet embellishments, omit the pepper and rosemary in the batter, and add a pinch of freshly grated nutmeg instead. 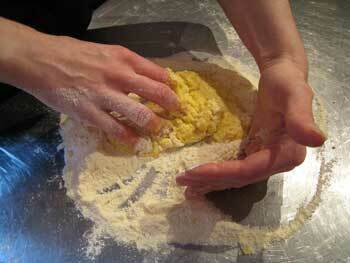 Make the spaetzle: Place the flour, 1/4 teaspoon of the salt, the pepper, and rosemary in a bowl. Mix well with a whisk. Make a well in the center and add the egg to the well. 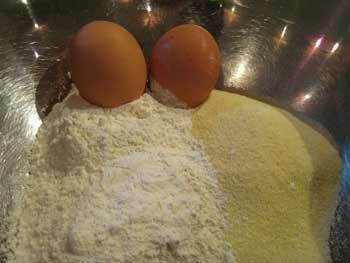 Start whisking the egg into the flour while you pour in the milk little by little. 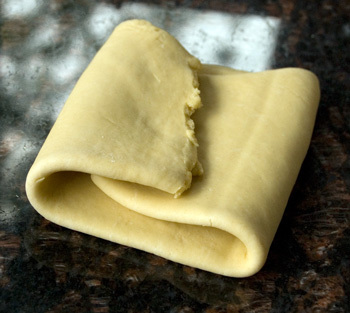 The aim is to have a perfectly smooth batter, so whisk vigorously when all the milk has been added. 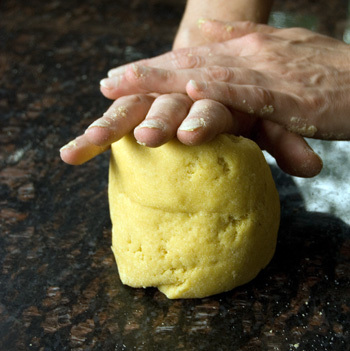 Whisking thoroughly also activates the gluten, making the spaetzle lighter when cooked. If not using right away, cover and set aside for up to 12 hours in the refrigerator; return to room temperature before cooking. 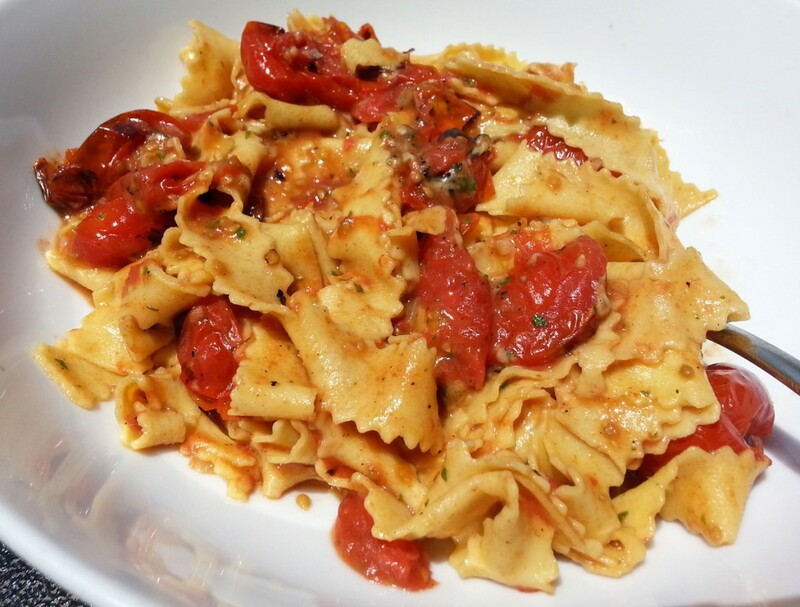 Make the sauce: Place the olive oil, garlic, fennel seeds, and chili flakes if using in a 12-inch skillet. Set over medium heat and cook until just aromatic, about 2 minutes. Watch that the garlic does not burn. Add the crumbled sausage and cook, stirring often to break it up into small pieces, until browned all over, about 5 minutes. 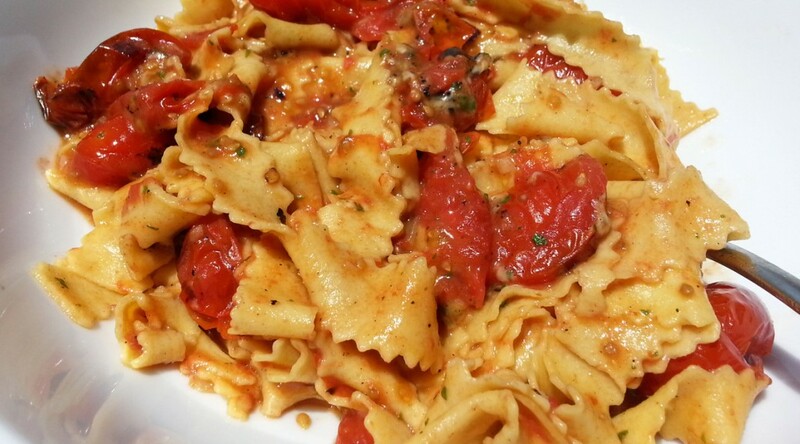 Remove from the heat until you are ready to serve; the sauce can be made to this point up to 2 hours ahead. Bring 4 quarts of water to a boil. Add the remaining tablespoon of salt and, using a spaetzle machine, drop the spaetzle into the boiling water. Cook until the spaetzle bob to the surface, about 1 minute, then drain, reserving 1 cup of the cooking water. 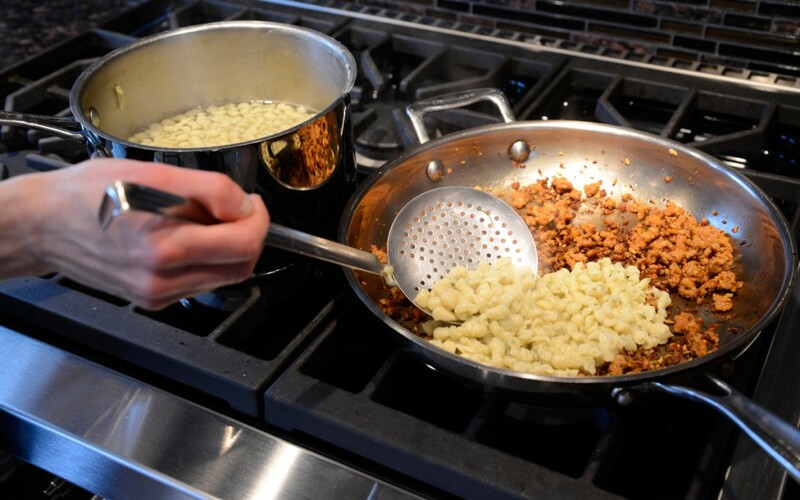 Spoon the spaetzle into the sausage in the skillet. Add the reserved cooking water and sauté over high heat 1 minute, or until the flavors have melded. Taste for seasoning and adjust, adding salt and pepper as needed. Serve hot, scattering dollops of Ricotta over the spaetzle here and there so you can combine the Ricotta with the spaetzle as you eat.